The avatar used on the HUNT the TRUTH SoundCloud profile. "What seems like the end, is only the beginning." 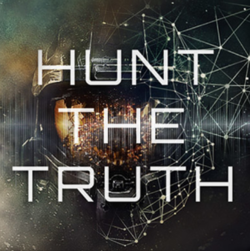 Hunt the Truth, stylized as HUNT the TRUTH or the hashtag #HUNTtheTRUTH, was a marketing campaign made by Ayzenberg Group for the release of Halo 5: Guardians, hosted on the popular microblogging and social networking site Tumblr. After a countdown ending on Sunday, March 22, 2015 at 6:00PM PST, the site displayed the "Halo 5 Bullet" trailer, as well as acting as the front page of journalist Benjamin Giraud's hunt for the truth about the story of Master Chief. Over the course of Season 1, Giraud updated the site weekly with his "part docu-diary, part audio archive" until E3 2015 in June 14, 2015. Season 2 premiered on September 22, 2015 and follows the story of FERO, a recurring character in Season 1. Hunt the Truth Season 1 started on March 22, 2015 and finished on June 14. It details the journey Benjamin Giraud did to discover the truth on the Master Chief. Hunt the Truth Season 2 started on September 22, 2015. It details FERO's story. On the same day the audio drama started, a bullet trailer was released. The trailer had a bullet shot out of an SRS99-S5 AM sniper rifle that rotated with several words on it finally ending up though the Master Chief's visor. On the Hunt the Truth Blog you can slow down the trailer to see clearly the words on the bullet and with each turn it reads: SON, ABDUCTEE, VICTIM, ORPHAN, RECRUIT, SOLDIER, WARRIOR, ALLY, HERO, SAVIOR, TRAITOR. An image of this is shown in the gallery below. "There are 2 sides to every story." Two live-action trailers were released on Sunday, March 29, 2015 as part of the marketing campaign. On April 24, 2015, four popular Halo YouTubers - Halo Follower, ReadyUpLive, ChiefCanuck, and Halo Canon - uploaded a video detailing that community members would have the option to record their voice to be used in an episode of Hunt the Truth. The deadline was April 27, 2015. The voice clips appeared in Season 1 Episode 6 and the Message from Sully Blog Post. Hunt the Signal was an ARG related to Hunt the Truth in which teams of four competed in order to have characters in Halo: The Fall of Reach - The Animated Series be created in their likeness. From Friday, May 15 to Sunday, June 14, 2015, a competition was held in Italy. Competitors had to fill in a registration form, and quickly answer five questions. The fastest eight competitors competed in a game of laser tag on June 28, 2015 for a copy of the Halo 5: Guardians Limited Collector's Edition. The minute long live-action trailer, A Hero Falls, debuted September 27, 2015, on Sunday Night Football. It was followed five days later by a longer trailer, The Hunt Begins. The first season of Hunt the Truth won a Bronze Clio Award in 2015, in the Audio category, for its Audio Drama. It also got over 6.7 Million views putting in the top 1% of all iTunes podcasts. Hunt the Truth establishes that Halo 2's cover art is actually an in-universe photograph captured and edited by Giraud. The circular symbols at the top of the Death Record are actually a modified form of Circular Gallifreyan from the British television show Doctor Who. Giraud's "Notice of Violation" features a QR code. When scanned, the code redirects the user to the Hunt the Truth Tumblr page. The officer who authorized the "Notice of Violation" ticket is a reference to Frank O'Connor, with both people sharing the same last name. Originally the Blog Post "The Twins" image had a typo "Background Nose". This was corrected a couple hours later to "Background Noise". A graphic showing the successive frames of the Halo 5 "Bullet" teaser. Halo 5 promotional art featuring Locke and John-117, displayed at the end of the "Bullet" teaser. The countdown to the HUNT the TRUTH reveal on March 23, 2015. View of the Blog for season 1. A grid from the site. An ad for Hunt the Truth with John-117. An ad for Hunt the Truth with Jameson Locke. Poster for voice actor submissions for Season 1 Episode 6. The hidden message in Season 1 Episode 6. Original image of Season 1 "The Twins" blog post, with the error "Background Nose". FERO's Season 1 script cover. Another avatar used for official Hunt the Truth content. An endorsed poster for the first season of Hunt the Truth. Art by Rudy Slama. Image used for Season 2 promotion. View of the Blog for Season 2. ↑ 6.00 6.01 6.02 6.03 6.04 6.05 6.06 6.07 6.08 6.09 6.10 6.11 Xbox Wire: Has the Master Chief Gone AWOL?